Grab your sombrero, call your amigos, and get ready to hit up some of the best bars that Wrigleyville has to offer! We’ll Grab Cinco by the Cervezas, by enjoying an entire spring afternoon of bar hopping, drinking beer, and hunting down our Cinco Aventuras while eating tacos. Reservations required. Must be 21+ to attend. Prices subject to increase based on availability. Tickets are NON-REFUNDABLE. All sales are FINAL. All sales are final and non-refundable under any circumstances. No cancellations, refunds or exchanges. All sales are final. Items in your order are non-transferable. Join Bash Events, Tecate and Dos Equis on Sunday, May 5th from 11am-4pm as we crawl through 10 of the best bars Wrigleyville has to offer! Grab your sombrero, call your amigos, dress to fiesta, and get ready to celebrate Cinco De Mayo the right way. We’ll Grab Cinco By The Cervezas, by enjoying an entire spring afternoon of bar hopping, drinking beer, eating tacos, and hunting down our Cinco Adventure. We will be crawling bar to bar, thumb wrestle a luchador, play Mexican plinko, decorating our tecate cans, shaking maracas, take swipes at our pinatas, and swing by our photo booth for epic Instagram-able post! We’ll be supplying t-shirts, sombreros, tacos, luchador masks and tons of other Cinco style giveaways for our participants! 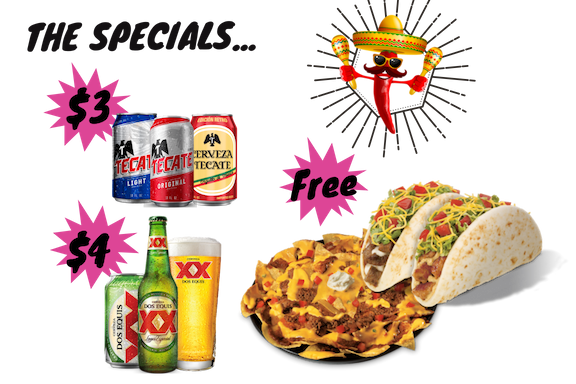 DRINK SPECIALS: $3 Tecate and $4 Dos Equis from 11am-4pm. FREE FOOD: Complimentary Tacos, Chips and Salsa at the following locations: Deuces and the Diamond Club and Slugger's Bar. Voucher needed to redeem. 1 complimentary serving per person. Redeem at one of the 2 approved locations listed above. CINCO AVENTURAS - PLAY TO WIN: Don’t leave Cinco without a story and play to win our Grand Prize Drawing!!! That's right, not only do we want you to enjoy refreshing drinks & delicious tacos... we want to make your Cinco an adventure to remember. Upon check-in, you will receive an Official Cinco Map and punch card with a list of activities. We will have you crawl bar to bar, thumb wrestle a luchador, play Mexican plinko, decorate your tecate can, grab a sombrero, build your own nachos, take swipes at our pinatas, swing by our photo booth and much more. Playing all activities will get you one punch closer to be entered in our Grab Cinco Drawing. You can play to win or crawl at your leisure at your favorite watering hole. *You MUST have an EVENT WRISTBAND to take advantage of Cinco Aventuras, Beer Specials, Free Food and Giveaways. GIVEAWAYS: $5 Uber Voucher, T-shirts, sombreros, Mexican wrestler masks, beer coozies, and much more Cinco de Mayo paraphernalia! *Limited quantities available. Sombreros for the first 500 guest checked in! Get them, while supplies last. 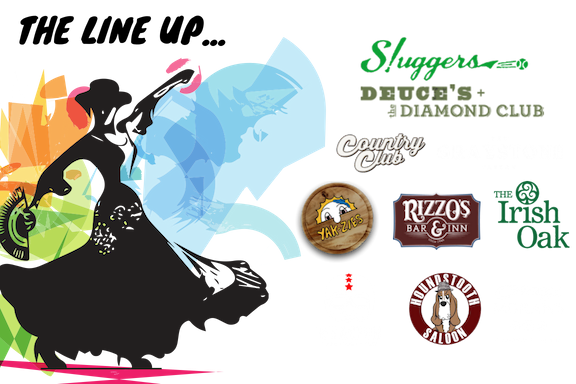 CHECK-IN LOCATIONS: Sunday, May 5th from 10:00am - 2:30pm to pick up your credentials at HVAC Pub in Wrigleyville. Once checked in you may begin enjoying the drink specials. PURCHASE TICKETS DAY OF EVENT: Limited amount of tickets will be available the day of the event. They can be purchased at our check-in locations: HVAC PUB in Wrigleyville from 10:00am - 2:30pm. WRISTBANDS: MUST BE WORN AT ALL TIMES. Each participant must have a wristband to participate in the event, partake in scavenger hunt, take advantage of drink specials, receive voucher for free food and giveaways. PURCHASE & ATTENDANCE POLICIES: Must be 21+ to attend and possess a valid state or federal ID. Tickets are NON-REFUNDABLE. All sales are FINAL. This is a rain or shine event. Giveaways are on a first come first serve basis. Get them while supplies last. Bash Events believes that everyone is entitled to have an enjoyable time. But in doing so we ask, first, that every participant has the responsibility to drink responsibly; and second, that the establishments will not serve any patron who appears to be visibly intoxicated. Furthermore, participating venues reserve the right to refuse entry to participants that are deemed intoxicated (or otherwise unfit) upon arrival.